What should be the ideal length of sentences in a blog post for ease of reading? I have heard many times that you should always keep the sentence length to the minimum as possible, as it makes reading easy, fast and more important understandable to readers. I'm wondering: What should be the ideal length threshold to follow for a sentence while writing a blog post? Sentences should not be longer than 25 words, and ideal length is around 14 words. when average sentence length is 14 words, readers understand more than 90% of what they’re reading. At 43 words, comprehension drops to less than 10%. Studies also show that sentences of 11 words are considered easy to read, while those of 21 words are fairly difficult. At 25 words, sentences become difficult, and 29 words or longer, very difficult. As a consequence, the GOV.UK style guide limits sentence length to 25 words. [l]ong sentences aren't just difficult for people who struggle with reading or have a cognitive disability like dyslexia or attention deficit hyperactivity disorder. They're also a problem for highly literate people with extensive vocabularies. This is partly because people tend to scan, not read. In fact, most people only read around 25% of what’s on a page. This means it’s important to get information across quickly. Long, complicated sentences force users to slow down and work harder to understand what they’re reading. This isn’t something people want to do, even if they’re familiar with the subject or language you’re using. It’s easy to assume this isn’t the case for highly literate readers or people considered experts. Yet the more educated a person is, and the more specialist their knowledge, the more they want it in plain English. These people often have the least time and most to read. Which means they just want to understand your point and move on, quickly. So, whoever your audience is, if you want your blog posts to be read, stick to the upper limit of 25 words and make most of your sentences around 14 words long. 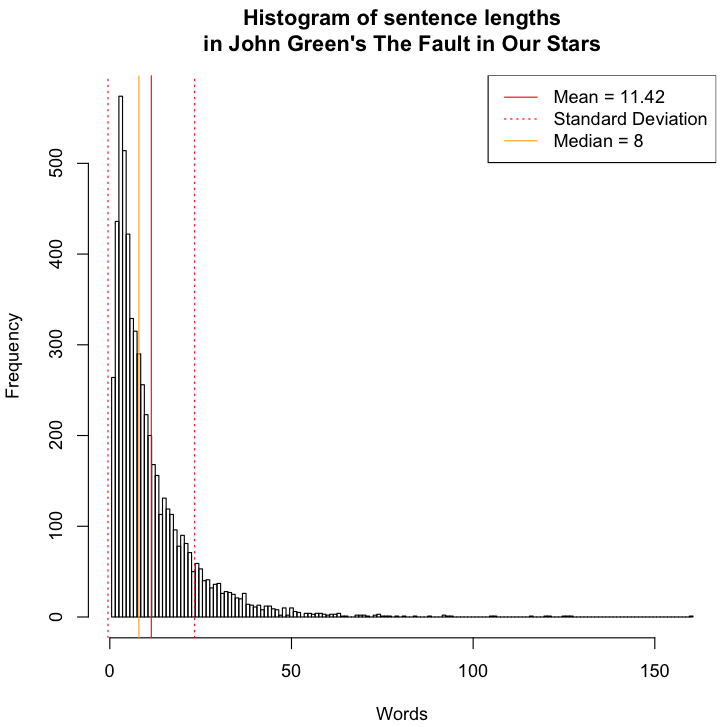 And while John Green's The Fault in Our Stars begins with the 52 word sentence cited by @DPT in their comment, it has an average sentence length of only 11.12091 words! The above are recommendations for English. So how about other languages? For German, the Deutsche Presse Agentur, the largest press agency in Germany, sets the upper limit for optimal comprehension at 9 words and the absolute allowed maximum length at 30 words. The Bild Zeitung, Germany's largest tabloid newspaper, has an average sentence length of 12 words. Ludwig Reiners in his book on style sets the maximum length of easy to understand sentences at 18 words; Wilfried Seibicke, a linguist and specialist in stylistics, recommends an average of 10 to 15 words. Given the similarity between the recommendations for English (an analytic language) and German (a fusional language), I would assume that other indoeuropean languages have similar ideal word lengths, while agglutinative (e.g. Turkic or Finnish) and polysynthetic languages, where sentences consist of very few very long words, will have other ideal lengths. This answer, by the way, has an average sentence length of 20.8125 words (not counting the citations). Each sentence must be exactly as long as it need be; never longer. Sentences establish the rhythm of your writing. Sentence construction -- length, rhythm, variation, and rhyme -- are the tools that align writing and oratorical style. A blog post is a short experience. You tease ideas. You dip a reader's mind into your logic and hope to bring them back for a fuller reveal. Writing must be interesting. You must get attention. You must gnarl expectations leaving a twisted discomfort that only more of your ideas can relax. Draw your reader into a conceptual labyrinth, drawn by the promise of a Minotaur-like concept that kills your stagnant processes and eats your quivering misconceptions. Show them that better life waits ahead. Just click. Readers will follow your link to reveal the greater message. It depends on your intended audience. If your audience is literature professors, then you can use pretty long and complex sentences, as long as you make sure that they are reasonably well-written. Indeed, those professors probably will get quite annoyed if all your sentences are too short and simple. You write for high school dropouts? Prefer short and simple sentences. Complex sentences challenge them. Of course the two examples above are extremes. But the basic point is, adapt to your audience. You have a lot of good (technical and detailed) answers here so I won't add too much. All I'll say is be careful of being too prescriptive with your writing. Repeated short sentences can sound staccato. Sentences that are laboriously long can lose the reader's attention and become difficult to untangle. Repeated sentences constructed to be exactly X number of words can sound monotone. "The secret to engaging writing is to mix things up a bit." Then read it all aloud and make sure it flows with a kind of musicality. If you can't get the words out of your mouth without stumbling, it's likely the reader will stumble over it, too. Good luck with your blogs! There is no specific rule about how many words should be there in a easy sentence. As long as the words used are not too complex, not repeating, and are delivering the message clearly, the sentence could be as long as 20 to 40 words (1-2 lines). Focus more on the grammar and punctuation, as they have to be correct for the content to be easily understandable. In general, writing for the web is expected to be shorter, with briefer sentences, paragraphs, and sections. The F-Shaped Scanning Pattern shows how users scan online, especially when they're not sure if they're invested in your material yet. Identify your key points. What piece of information is the key fact you want your readers to know, even if they only read a single paragraph or sentence on the page? What effectively summarizes all the information that will follow? Rank secondary information. Outline the story details and supporting information, prioritizing the information that is most likely to be of interest to the broadest audience, and moving down the list to the smaller and more nuanced details. Write well and concisely. The structure only helps readers if the content is strong. Cut unnecessary information. Get to the point quickly. Use straightforward language. Use short paragraphs and bulleted lists. Frontload all elements of content with important information. The main headline should be descriptive. The story should start with the main point. Each heading or subheading should be descriptive. The first sentence of every paragraph should be the most important. The first words in each sentence should be information-carrying and indicate what content will follow. Plan Language is for Everyone, Even Experts. If you think clearly, you will express yourself clearly. Your audience wants easy-to-read content that allows them to get the gist of the message efficiently. No one has ever complained that a text was too easy to understand. Again, different blogs have different goals and audiences, but on the whole, simpler seems to be better. Still include as much information as is relevant, and vary sentences and everything for stylistic choices and to stay true to your own writing voice. But recognize the audiences may be less patient than you'd wish; simplicity seems to be the current ideal. Generally, a sentence in writing should be 10 words or less with 7 WoL being your goal. You can have longer sentences, but if you do, they should be used sparingly or with good reason (such as an excerpt of purple prose for your readers). Longer sentences add more information and more information creates more opportunity to be unclear or confusing. As with all things in writing: just be careful how you do it. TLDR: The shorter the better. Long version: Respect people's time. Say what you need to say. Be as concise as possible. Not the answer you're looking for? Browse other questions tagged creative-writing blog or ask your own question. How long is too long for a blog post? How large should photos on my blog be?